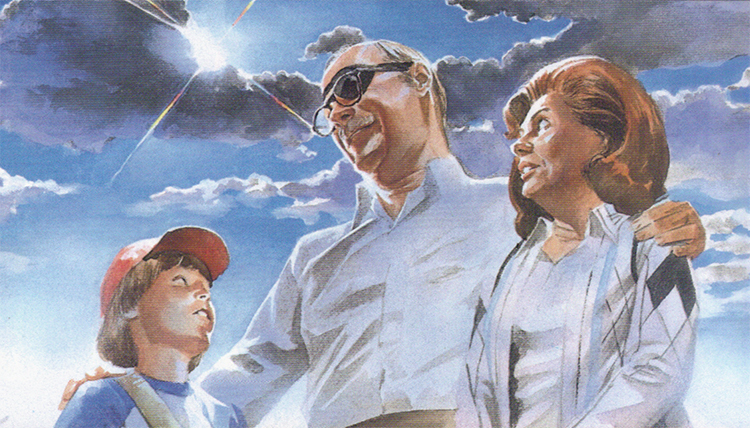 This narrative vision constructed by Busiek, however, manifests in the near-photorealistic painting of Alex Ross which provides a Rockwellian patina of troubling idealism that passes for “realism.” Thus, I am as skeptical of it as I am of Rockwell’s vision of America—white bread with a touch of calculated cheek, and a certain ennobling of post-War America that erases its messiness and diversity. While certain scenes Ross paints—double-page splashes of Namor’s tidal wave crashing over the Brooklyn bridge, nasty white American faces calling for “Mutie” blood—are certainly impressive, overall the art is static and turgid, much more appropriate for covers than for interior art, and robbed of all the dynamic cartooning that makes superhero comics a visual pleasure. I imagine it akin to what the apocalypse would look like painted with the gloss of affected middle-class folksiness of a Saturday Evening Post cover. I could perhaps accept the posed quality if the whole narrative were told through the perspective of Sheldon’s photos—moments frozen in time with word balloons like a painted fumetti, but alas, there is nothing here so inventive.The tensions in Sheldon’s view of the superhero world birthed around him are undercut by the art, and Ross’s penchant to use celebrity faces on his perfectly rendered models disrupts the illusion that these are reproductions of actual events that might give the art style gravity. Sure, I can see how the art and Sheldon’s recurring disappointment with the cynicism of his peers are a response to the historical moment from which Marvels emerges. From that perspective it makes sense that there were Marvel readers who wanted an alternative to what popular comics had turned into in those years, the swollen proportions of heroes, the gratuitous cheesecake, the easy violence, the storm of blood and blades and enormous guns. Marvels returns to a supposedly better era, but doesn’t merely reconstruct a naive and outdated view of superheroes, but transfers the burden for reimagining the genre to the readers through Sheldon’s constant return to admonishing his fellow citizens for their lack of faith, for their willingness to gossip, think the worst of their intentions, and hound these divine figures until some of them lashed out and became the villains they were sometimes accused of being. In other words, Deadpool is our own fault. When Sheldon’s ongoing project of photographing and writing about the “Marvels” (he had already authored a coffee table book of the same name) turns into a book in which he’d tell the public “what they should mean to [them],” Marvels too easily escapes the tensions of Marvel Comics’ flawed heroes. In the end, Sheldon abandons that project because he realizes he is too close to the subject to make sense of it anymore. Instead, he retires to spend more time with his family. He passes the torch to his assistant. This is a faint echo of days when readers outgrew comics and passed them on to a younger sibling or a neighbor. Sheldon has a final picture taken with “a nice normal ordinary boy” named Daniel Ketch reinforcing constant rebirth of heroes fit for each generation, as the well-versed Marvel fan will recognize the kid’s name as belonging to a future incarnation of Ghost Rider (in 1990’s Ghost Rider vol. 3, #1). Superhero appreciation exists in a chain linked across time. Sheldon moves on, and like Superman in “Whatever Happened to the Man of Tomorrow?”, what follows his time in a world of superheroes is a domesticity that rejects the wild possibilities of that imagined universe. While that ending points to a time when comics reading and collecting was passed from an older generation to a younger one, as parents, uncles, older siblings, neighbors outgrew the four-color fantasies, this is less and less the case. The transition from the Silver to Bronze Age already challenged that tradition, as Marvel comics were popular among high schoolers and college students and counter-culture types, not just little kids, as the 1960s turned to the 70s because they saw something beyond child-like worshipfulness in those stories. If Busiek had written a more complex return to Marvel history that brought to the surface the way that Marvel stories challenged the frequent conservative, reactionary underpinning of the genre—even while frequently recapitulating the worst forms of racial and gender representation—then Marvels would indeed be something worth celebrating. Instead, this look back gives readers a glossed over version that, as Sean Howe reminds us in Marvel Comics: The Untold Story, presents “late-twentieth-century America…[with] no mention of the Cuban Missile Crisis, no plague of race riots, no campus protests of the Vietnam War—even though the Marvel Comics of the 1960s and early 1970s had tackled political and social issues quite explicitly” (358). In other words, by reducing the perspective to that aging and worshipful visionary, Busiek and Ross fall victim to the worst results of nostalgia instead of showing readers the complex possibilities of post-war superhero comics. The potential is there in Sheldon’s fear of Namor and the Human Torch, his easy adoption of anti-mutant bigotry, in a flash of newspaper clipping about Iron Man attacking student protesters, and in Luke Cage’s ambivalence about having his picture in the paper, but it all serves a whitewashed greatest-hits view of what could have been a more challenging, and dare I say marvelous, historiography. Perhaps the greatest facet of serialized comic books are their multi-directional possibilities for revision and reimagining. And yes, I also think it is the source of their worst and most insular tendencies as well, but when that revisionist tendency is used to undo and comment upon the problematic aspects of the genre it is beautiful thing. Much of what went wrong with superhero comics in the 1990s was a turn to cynicism that saw history and politics as an instrument of “realism,” rather than source for not only the possibilities of greater inclusion, but imagining new ways of being, new forms of relationships between diverse and complex people. In his recent book, The New Mutants: Superheroes and the Radical Imagination of American Comics, scholar Ramzi Fawaz spends a lot of his time analyzing comics from the same period Marvels revisits. He coins the term comic book cosmopolitics to describe how postwar comics books like the Fantastic Four “valued the uncertainty of cross-cultural encounter and the possibilities afforded by abandoning the claims of individualism in exchange for diverse group affiliations.” He goes on to claim that “[this achievement] was formed in the mutual transformation of creative content of superhero comic books and the changing values of an emerging participatory reading public that actively conversed with the comic book creators about the form and political content of the fantasy worlds they produced” (16; emphasis his). I would add to this, and I think Fawaz would agree, that the conversations between and among readers were equally as important, as throughout his book he provides ample evidence of the influence of letter writing fans who took seriously the moral, ethical and social implications of the worlds inhabited by their favorite characters. I raise this here not only because Marvels’ vision of that time ultimately fails that vision of possibility with all its limits and benefits, but also because Busiek of all people should know better as he was once one of those deeply engaged letter-writing readers, who, if his interviews, tweets and podcast appearances are to be believed, still has strong feelings about those worlds and their ethical stakes. 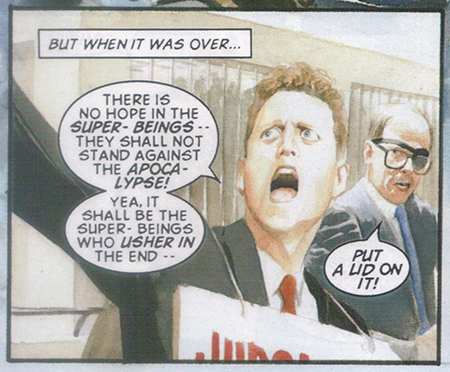 Instead Marvels presents readers with an ossified vision. Sheldon sees the world through his dead-eye not the live one. It may be true that the apocalyptic fascination of comics of the last 20 years has flattened the beautifully generous possibilities of Marvel superhero comics that Fawaz writes about into a preoccupation with bare survival (271). And, it may often seem as if every issue is a sub-chapter in a crossover or coming crisis concerned with an extinction that can only be mitigated by the recovery of a status quo, and not a move towards a thriving future. The answer to this, however, is not a return to an uncritical homage to the Silver Age. This does not (and did not) cure the genre of that moral ailment. It just reinforces its flaccid white straight vision rather than envision what a better eye could see was there all along. Marvels does not hold up. It fails as a project. And even though I can appreciate what it was trying to do in context of comics like X-Force and Spawn, it provides an alternative no more generative. If anything, it is less generative, as talk of the old days is in nearly all contexts. At least, nowadays there is sense of lightness returning to some comics—in Squirrel Girl and Spider-Woman—and some glimmers of diverse possibility that can never be achieved by simply going back and shoring up a troubling and obscurant history. 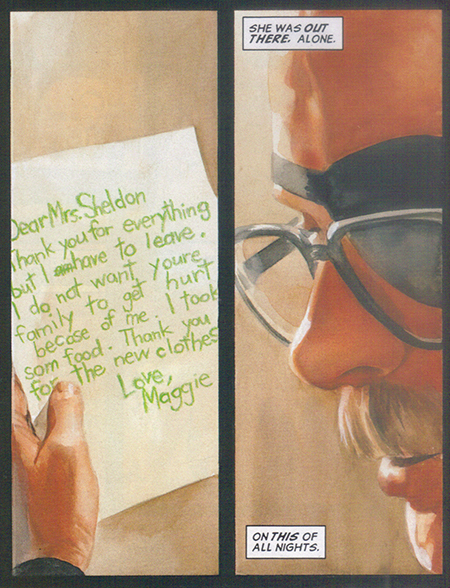 As a final note, in 2008, Busiek (with other artists) returned to the life of Phil Sheldon in Marvels: Eye of the Camera, but while I haven’t read all of it (yet), what I have read reveals it to be an anemic and unnecessary retreading of familiar ground put against the backdrop of Sheldon’s incurable cancer for an extra layer of pathos that seems gratuitous.. It doesn’t rise to the challenges I think a backward-looking project needs to tackle. Phil Sheldon with his wife Doris and “normal boy” Daniel Ketch (who will one day be possessed by a motorcycle-riding avenging demon). Your knowledge and thorough analysis of comics always leaves me awestruck. Great insight. Whilst I find Marvels enjoyable in the nostalgic sense, I agree that it holds nowhere near as much depth as it would like to think. Osvaldo, I love your analysis of comics as an art form, and appreciate you dropping by my blog some time ago! I have to say though, I feel quite differently than you did about Marvels. While I still love the book, I also don’t think it holds up as well as it used to, but then again there are two things I think get lost in the shuffle when considering the book’s impact nowadays. First, you have to keep in mind that the closest thing we had to a Marvel cinematic universe back then was maybe the 1990 Captain America movie (on which the less said, the better), or maybe the Incredible Hulk TV show of the 70s. Ross’ art may seem quaint or stagnant now, but I think a huge reason for that is because we are surrounded by “real life” takes on superheroes today, and there has been a huge change in our perception of them. Second, keep in mind that collected volumes of Silver Age Marvel comics were few and far between back then. There were no Omnibuses or even paperbacks of the Lee/Kirby glory days, and Marvel Masterworks had just gotten started but stopped in the mid-90s because they weren’t profitable. Marvels to a lot of readers was a look back at a fondly remembered time that was long forgotten, despite being something that had laid the basis for the entire industry. I guess what I’m saying, ultimately, is the book was definitely a product of its time. Its theme- plain old nostalgia- may not hold up today as well as Watchmen or DKR, but at the same time I don’t think it ever intended to or needed to. I’d love to hear your take on Kingdom Come one of these days if you get a chance. Thanks again for posting, big fan of your work. God bless! Thanks for your comments! I have not visited your site in a while, so need to catch up because I see you have a bunch posted since the last time I looked. As I said in the post, I remember LOVING Marvels when I first read it soon after it came out, so maybe you’re right about the necessity of its nostalgia – esp. in light of the 90s style of Marvel comics – but even in that context I think uncritical nostalgia does a disservice to those stories. 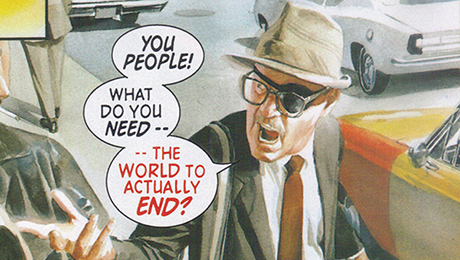 Considering that the era Marvels covers was deeply embedded in the continuity of stories that followed for 20 years after their initial publishing, and how they existed both in vast collections and in the collective memory of readers who might not have even been alive when those stories first came out, the need for a complicating counter-narrative remains clear to me. At least the art is fantastic. I normally wouldn’t approve a comment that is just a link, but I am making an exception because I think it is a potentially important point (or at least a suggested one. I’d prefer you explicitly explain what you are trying to say by sharing it). Anyway, I don’t think this one painting, regardless of its subject and historical importance, changes the context of the world most often evoked and imagined by Rockwell’s paintings.